Thought Technology's HRV starter system is ideal for clinicians who want to begin exploring heart rate variability biofeedback without overwhelming their budget. This medical grade system provides out-of-the-box functionality with a set of simple tools for assessing and training HRV. A powerful method for exercising your client’s cardiovascular system. Assess and document your client’s baseline HRV levels by running the 3 step HRV assessment. The HRV Starter System includes the ProComp 2, a medical grade physiological monitoring device, with easy-to-fasten finger pulse HR/BVP and respiration sensors to provide direct measures of heart rate and breathing. 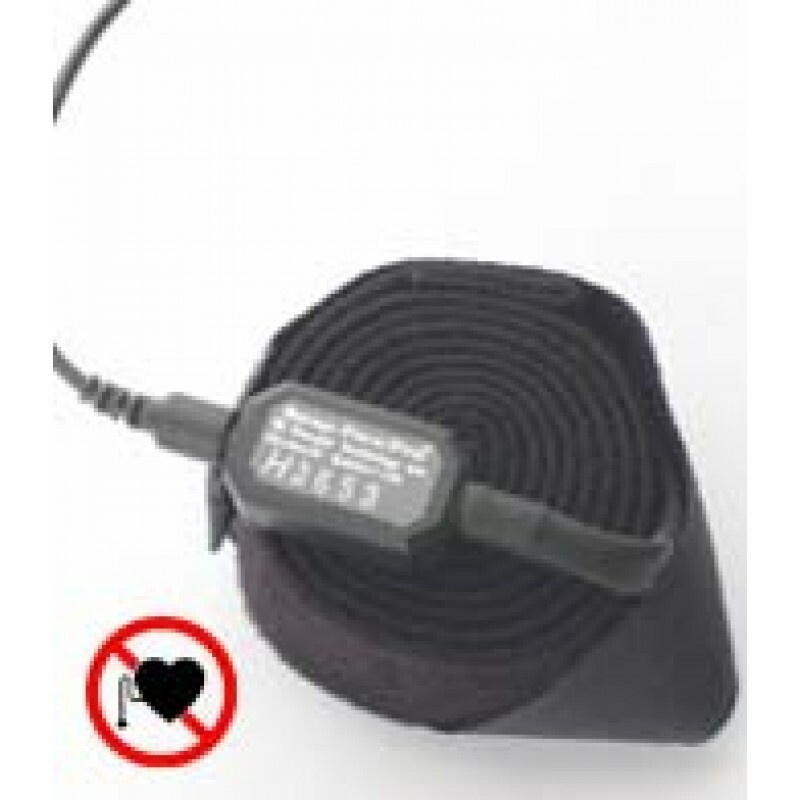 Introduce heart rate variability biofeedback into your practice with this compact and easy to use two-channel device which comes with a finger pulse and a respiration sensor, powerful multimedia biofeedback software and the HRV Suite. Many physiological factors influence the timing of heart beats, including respiration, blood pressure changes and the interplay between the sympathetic and parasympathetic nervous systems. HRV is an important physiological measure because the loss of variability can be an indicator of serious cardiovascular health problems. HRV biofeedback is a powerful tool for monitoring changes in the timing between heartbeats and exercising the cardiovascular system to maximize variability. AS EASY AS 1, 2, 3: • Assess and document your client’s baseline HRV levels by running the 3 step HRV assessment. • Teach your clients awareness and control of breathing patterns and how breathing influences heart rate. • Train your clients to use breath control to entrain deep and effective relaxation. NO STRAIN SOLUTION: • Easy tool lets you add HRV biofeedback techniques to your practice. • Concrete physiological measures help validate your assessments. • Encourages client commitment with simple reporting. • Facilitates behavioral change with engaging biofeedback. 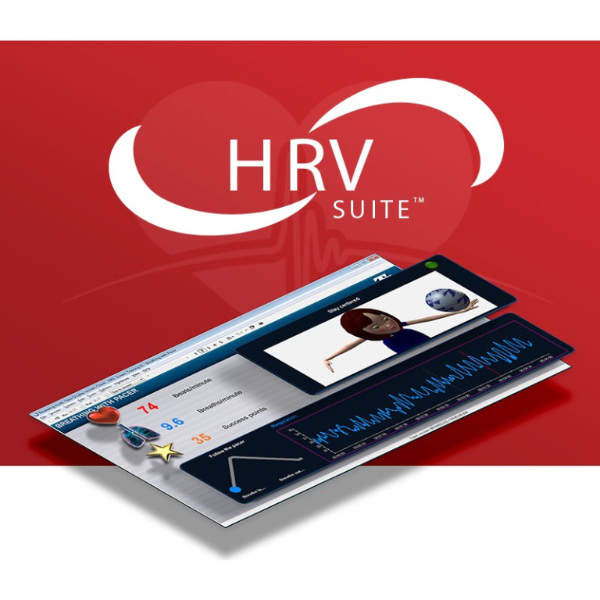 The HRV suite works with the ProComp 2, a medical grade physiological monitoring device, and easy to fasten finger pulse and respiration sensors which are essential to effective HRV training. The ProComp2™ is a compact yet powerful 2 channel device that allows clinicians to set up a second clinical system – or to empower their clients by offering them a take-home device that is convenient to wear on a headband or shirt collar. The ProComp2™ can use any two of the ProComp Infiniti™ sensors or expand to neurofeedback with as it includes a built-in EEG sensor (simply connect an extender cable for EEG monitoring and biofeedback). 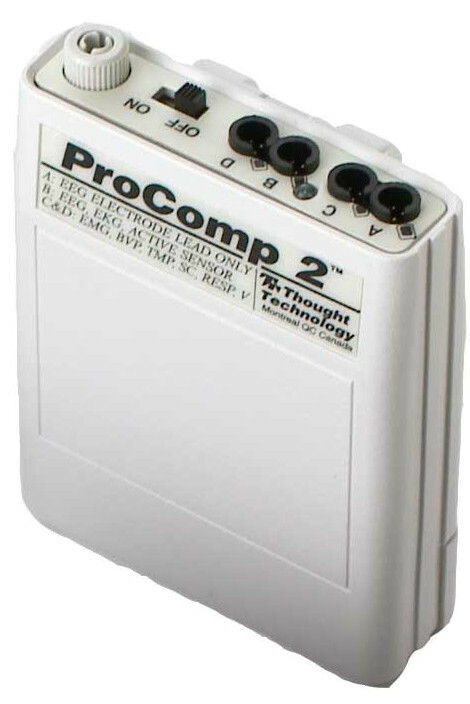 The ProComp2™ system contains all the peripherals to easily connect it to a desktop or laptop IBM-compatible PC.